You need continuing education credits to maintain your NAHB designation – and NAHB Education has made it simpler for you to find courses through the NAHB Continuing Education Providers Directory. In addition to attending NAHB Education courses and conferences and participating in NAHB webinars, designation holders may earn continuing education credit from other approved sources. You can find them by searching this directory, which includes both in-person and Web-based learning opportunities. Search by keyword, event type, city, state, and designation. Questions about continuing education requirements? 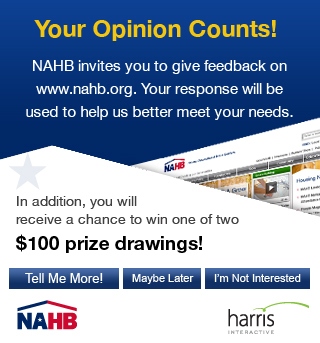 Contact the NAHB Professional Designation Help Line at 800-368-5242 x8154 or email designations@nahb.org. Are you interested in offering classes for continuing education? Find out how to list your educational event. How much continuing education do I need to maintain my NAHB designation? Visit the Continuing Education Requirements for NAHB Designation page of the NAHB website. Unclear about what counts as continuing education? Contact the NAHB Professional Designation Help Line at 800-368-5242 x8154 or email designations@nahb.org. Mark your calendars! Make your plans to attend the 2019 International Builders' Show Feb. 19-21 in Las Vegas, NV. You'll find dozens of educational sessions on a wide range of building industry topics. The NAHB Continuing Education Providers Directory is solely for educational and informational purposes. Nothing in this directory should be construed as policy, an endorsement, warranty or guaranty by the National Association of Home Builders. NAHB disclaims any responsibility for any damages arising from the use, application or reliance on any information contained in this directory.